For the first time since 2012, the Money in the bank contract will be on the line as Kevin Owens will take on Braun Strowman. If Strowman loses the match in any way, Owens wins the contract, and that will be exactly what will happen. As I mentioned in previous articles, Strowman winning the contract made no sense in the first place, as it doesn't fit his character, and he doesn't need the contract to get into the title picture. It fits Owens' character perfectly, and if he wins the contract it could make the main event match between Roman Reigns and Brock Lesnar more interesting. If Paul Heyman turns on Lesnar, Owens would be a perfect Heyman guy, although he would do just fine without Heyman as well. 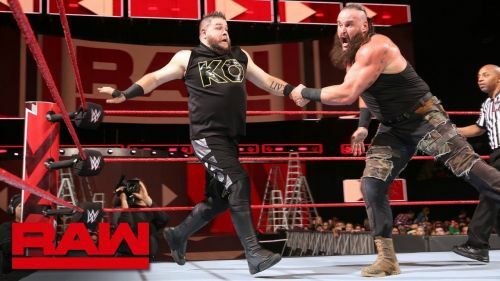 The stipulation of this match also helps as well, since Owens does not have to pin Strowman to win the match, and Strowman will look strong, even in defeat. I see Owens antagonizing Strowman to the point where he snaps and gets himself disqualified, just like what Christian did to Randy Orton during their feud.